Michael Laudrup plans to stop Swansea City players becoming complacent ahead of Sunday's Capital One Cup final by showing footage of opponents Bradford's giant-killing exploits. The Swans are overwhelming favourites to beat a team 72 places below them in the English league pyramid. But manager Laudrup says his side will not take anything for granted. "I can show the DVDs from the Wigan game, the Arsenal game and the two games against Aston Villa," he said. Bradford have accounted for all three Premier League clubs on their way to Wembley. 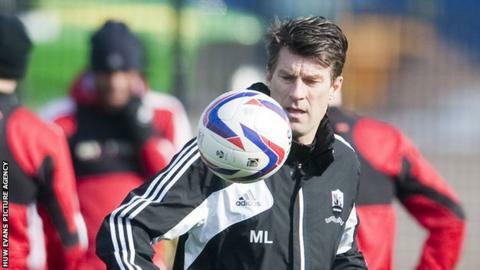 That fact alone, says Laudrup, will keep his team on its toes. "We have to accept that we are favourites, but I think all my players they know that this is a unique situation for us, but even more for Bradford," said the Dane. "We're talking history here, and even more so if they [Bradford] could win this game. "So I'm sure that my players will not underestimate Bradford." Another fact which Laudrup believes will help his side maintain their concentration is the fact that no-one expected Swansea to get to the final. "It's not the underdog against one of the big teams, it's the under-under-underdog versus the underdog," he said. Swansea themselves have never appeared in a major Wembley cup final before, and Laudrup says he's looking forward to leading his team out. "I'll be very proud," he said. "It's [Swansea's] first final, at Wembley, it's huge. It will be a great day for everybody in this town so let's hope it ends as well as it starts. "We will try to do our best but again we will accept that we have to the initiative in the game and they will play a lot on the counter and at the set-pieces where they have been very very good during this competition." The Swans are making no special preparations for the match, training as normal on Friday and Saturday mornings before travelling to Wembley. "All I've told my players is to enjoy it," said Laudrup. "I hope it doesn't turn out this way, but for some of them it may be the first and the last time they go out there [Wembley]." Read more on League Cup final: Is this the biggest game in Swansea history?